For other angelic hierarchies, see Hierarchy of angels. 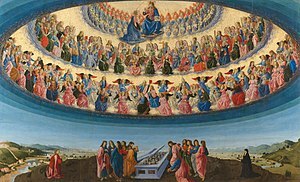 The Assumption of the Virgin by Francesco Botticini at the National Gallery London, shows three hierarchies and nine orders of angels, each with different characteristics. 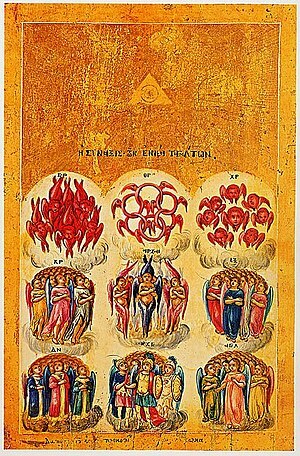 Orthodox icon of nine orders of angels. In Christianity, angels are agents of God, based on angels in Judaism. The most influential Christian angelic hierarchy was that put forward by Pseudo-Dionysius the Areopagite in the 4th or 5th century in his book De Coelesti Hierarchia (On the Celestial Hierarchy). During the Middle Ages, many schemes were proposed about the hierarchy of demons, some drawing on and expanding on Pseudo-Dionysius, others suggesting completely different classifications. According to medieval Christian theologians, the angels are organized into several orders, or "Angelic Choirs". Pseudo-Dionysius (On the Celestial Hierarchy) and Thomas Aquinas (Summa Theologica) drew on passages from the New Testament, specifically in Galatians 3:26-28, Matthew 22:24-33, Ephesians 1:21-23, and Colossians 1:16, to develop a schema of three Hierarchies, Spheres or Triads of angels, with each Hierarchy containing three Orders or Choirs. Although both authors drew on the New Testament, the Biblical canon is relatively silent on the subject, and these hierarchies are considered less definitive than biblical material. As referred to in the theological doctrine of the communion of saints, in Paradise there is a common and unique vision of the truth and contemplation of the Face of God, without any kind of difference between angels or human souls. The Summa theologiae states that there exist different degree in respect of the creation, about the power of intercession to God and of direct entrustment in the human lives. The first sphere angels serve as the heavenly servants of God the Son incarnated. Seraphim surround the divine throne in this illustration from the Petites Heures de Jean de Berry, a 14th-century illuminated manuscript. Seraphim (singular "Seraph") literally translated "burning ones", the word seraph is normally a synonym for serpents when used in the Hebrew Bible. Mentioned in Isaiah 6:1-7, Seraphim are the highest angelic class and they serve as the caretakers of God's throne and continuously shout praises: "Holy, holy, holy is the Lord of hosts; the whole earth is full of His glory!" According to Isaiah 6:1-8, the Seraphim are described as fiery six-winged beings; with two wings that cover their faces, with another two that cover their feet, and the last two they use to fly. A cherub, as described by Ezekiel and according to traditional Christian iconography. Cherubim have four faces: one of a man, an ox, a lion, and an eagle (later adopted as the symbols of the four evangelists). They have four conjoined wings covered with eyes (although Revelation 4:8 appears to describe them with six wings like the seraphim), a lion's body, and the feet of oxen. Cherubim guard the way to the tree of life in the Garden of Eden (Genesis 3:24) and the throne of God (Ezekiel 28:14–16). Modern English usage has blurred the distinction between cherubim and putti. Putti are the often wingless (sometimes winged) human baby/toddler-like beings traditionally used in figurative art. St. Thomas Aquinas imagined Satan as a fallen Cherub. One traditional depiction of the chariot vision, based on the description in Ezekiel. The "Thrones" (Greek: thronoi, pl. of thronos), or Elders, are a class of celestial beings mentioned by Paul the Apostle in Colossians 1:16 (New Testament). They are living symbols of God's justice and authority, and have as one of their symbols the throne. It is not unusual to find that the Thrones are associated, by some, with the Ophanim or Erelim from the Jewish angelic hierarchy. However there is very little evidence[clarification needed], if any, to sustain this idea. The Ophanim (Heb. ofanim: Wheels, from the vision of Daniel 7:9) are unusual looking, even compared to the other celestial beings, plus they are said to be moved by the spirit of other beings. Which then raises the question if the Ophanim are spiritual beings at all or if they are purely material beings. They appear as a beryl-coloured wheel-within-a-wheel, their rims covered with hundreds of eyes. They are closely connected with the Cherubim instead: "When they moved, the others moved; when they stopped, the others stopped; and when they rose from the earth, the wheels rose along with them; for the spirit of the living creatures [Cherubim] was in the wheels." Ezekiel 10:17 NRSV. Christian theologians that include the Thrones as one of the choirs do not describe them as wheels, describing them as adoring elder men who listen to the will of God and present the prayers of men. The Twenty Four Elders in the Book of Revelation are usually thought to be part of this group of angels. West window of the Church of St Michael and All Angels, Somerton. It depicts Christ the King in the centre with nine angelic figures, each of them represents, higher row: Dominions, Cherubim, Seraphim, and Angels; lower row: Principalities, Thrones, Archangels, Virtues, and Powers. Angels of the Second Sphere work as heavenly governors of the creation by subjecting matter and guiding and ruling the spirits. The "Dominions" (Eph. 1:21; Col. 1:16) (lat. dominatio, plural dominationes, also translated from the Greek term kyriotētes, pl. of kyriotēs, as "Lordships") or "Dominations" are presented as the hierarchy of celestial beings "Lordships" in some English translations of the De Coelesti Hierarchia. The Dominions regulate the duties of lower angels. It is only with extreme rarity that the angelic lords make themselves physically known to humans. The Dominions are believed to look like divinely beautiful humans with a pair of feathered wings, much like the common representation of angels, but they may be distinguished from other groups by wielding orbs of light fastened to the heads of their scepters or on the pommel of their swords. These angels are those through which signs and miracles are made in the world. The term appears to be linked to the attribute "might", from the Greek root dynamis (pl. dynameis) in Ephesians 1:21, which is also translated as "Virtue" or "Power". They are presented as the celestial Choir "Virtues", in the Summa Theologica. "The name of the holy Virtues signifies a certain powerful and unshakable virility welling forth into all their Godlike energies; not being weak and feeble for any reception of the divine Illuminations granted to it; mounting upwards in fullness of power to an assimilation with God; never falling away from the Divine Life through its own weakness, but ascending unwaveringly to the superessential Virtue which is the Source of virtue: fashioning itself, as far as it may, in virtue; perfectly turned towards the Source of virtue, and flowing forth providentially to those below it, abundantly filling them with virtue." The "Powers" (lat. potestas (f), pl. potestates), or "Authorities", from the Greek exousiai, pl. of exousia (see Greek root in Eph 3:10). The primary duty of the "Powers" is to supervise the movements of the heavenly bodies in order to ensure that the cosmos remains in order. Being warrior angels, they also oppose evil spirits, especially those that make use of the matter in the universe, and often cast evil spirits to detention places. These angels are usually represented as soldiers wearing full armor and helmet, and also having defensive and offensive weapons such as shields and spears or chains respectively. Angels who function as heavenly guides, protectors, and messengers to human beings. The "Principalities" (Latin: principatus) also translated as "Princedoms" and "Rulers", from the Greek archai, pl. of archē (see Greek root in Eph 3:10), are the angels that guide and protect nations, or groups of peoples, and institutions such as the Church. The Principalities preside over the bands of angels and charge them with fulfilling the divine ministry. There are some who administer and some who assist. The Principalities are shown wearing a crown and carrying a sceptre. Their duty also is said to be to carry out the orders given to them by the upper sphere angels and bequeath blessings to the material world. Their task is to oversee groups of people. They are the educators and guardians of the realm of earth. Like beings related to the world of the germinal ideas, they are said to inspire living things to many things such as art or science. Paul used the term rule and authority in Ephesians 1:21, and rulers and authorities in Ephesians 3:10. Guido Reni's archangel Michael (in the Capuchin church of Santa Maria della Concezione, Rome, 1636) tramples Satan. The word "archangel" comes from the Greek ἀρχάγγελος (archangelos), meaning chief angel, a translation of the Hebrew רב־מלאך (rav-mal'ákh) It derives from the Greek archein, meaning to be first in rank or power; and angelos which means messenger or envoy. The word is only used twice in the New Testament: 1 Thessalonians 4:16 and Jude 1:9. Only the Archangel Michael is mentioned by name in the New Testament. In most Christian traditions Gabriel is also considered an archangel, but there is no direct literary support for this assumption. It is also worth noting that the term 'archangel' appears only in the singular, never plural, and only in specific reference to Michael. The name of the archangel Raphael appears only in the Book of Tobit (Tobias). Tobit is considered Deuterocanonical by Roman Catholics (both Eastern and Western Rites), Eastern Orthodox Christians, and Anglicans. The Book of Tobit is not, however, acknowledged by most Protestant denominations, such as Reformed Christians or Baptists. Raphael said to Tobias that he was "one of the seven who stand before the Lord", and it is generally believed that Michael and Gabriel are two of the other six. A fourth Archangel is Uriel whose name literally means "Light of God." Uriel's name is the only one not mentioned in the Western Christian Bible, but plays a prominent role in an apocryphon read by Anglican and Russian Orthodox Christians: The second Book of Esdras (fourth Books of Esdras in the Latin Vulgate). In the book, he unveils seven prophecies to the prophet Ezra, after whom the book is named. He also plays a role in the apocryphal Book of Enoch, which is considered canonical by both the Ethiopian Orthodox and Eritrean Orthodox Church. The Catholic Church does not regard Uriel as an angel just as the Book of Enoch is not part of the Catholic Bible either. Another possible interpretation of the seven archangels is that these seven are the seven spirits of God that stand before the throne described in the Book of Enoch, and in the Book of Revelation. The Seven Archangels are said to be the guardian angels of nations and countries, and are concerned with the issues and events surrounding these, including politics, military matters, commerce and trade: e.g. Archangel Michael is traditionally seen as the protector of 'Israel' and of the ecclesia (Gr. root ekklesia from the New Testament passages), theologically equated as the Church, the forerunner of the spiritual New Israel. Some[who?] make a distinction between archangel (with a lower-case a) and Archangel (with an uppercase A). The former can denote the second-lowest choir (arch-angels in the sense of being just above the lowest Choir of angels that is called only "angels") but the latter may denote the highest of all the angels (i.e., Arch-angels in the sense of being above all angels, of any Choir. The seven highest Seraphim, Michael, being the highest of all). 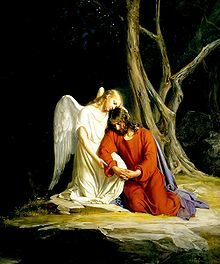 An angel comforting Jesus, by Carl Heinrich Bloch, 1865-1879. The "angels" or malakhim (Heb. : מַלְאָכִים), i.e. the "plain" angels (Gr. : ἄγγελοι, pl. of Gr. : ἄγγελος, angelos, i.e. messenger or envoy), are the lowest order of celestial beings, and the most recognized. They are the ones most concerned with the affairs of men. Within the category of the angels, there are many different kinds, with different functions. The angels are sent as messengers to humanity. Personal guardian angels come from this class. 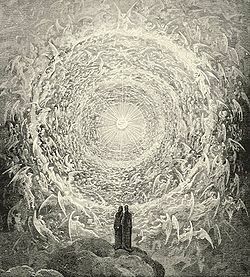 The angelic choirs circling the abode of God, from Dante's Paradiso, illustrated by Gustave Doré. 1. Seraphim, 2. Cherubim, 3. Aeons, 4. Hosts, 5. Powers (=Virtues, Greek dynameis), 6. Authorities, 7. Principalities, 8. Dominions, 9. Thrones, 10. Archangels, 11. Angels. 1. Seraphim, 2. Cherubim, 3. Dominations, 4. Thrones, 5. Principalities, 6. Potentates (or Powers), 7. Virtues, 8. Archangels, 9. Angels. 1. Seraphim, 2. Cherubim, 3. Powers, 4. Dominions (Dominations), 5. Thrones, 6. Archangels, 7. Angels. Third sphere: 7. Principalities, 8. Archangels, 9. Angels. 1. Seraphim, 2. Cherubim, 3. Thrones, 4. Dominations, 5. Principalities, 6. Powers, 7. Virtues, 8. Archangels, 9. Angels. 1. Seraphim, 2. Cherubim, 3. Thrones, 4. Dominions, 5. Powers (=Virtues), 6. Authorities, 7. Rulers (=Principalities), 8. Archangels, 9. Angels. 3. Principalities, Archangels, and Angels. 1. Seraphim, 2. Cherubim, 3. Thrones, 4. Dominations, 5. Virtues, 6. Powers, 7. Principalities, 8. Archangels, 9. Angels. 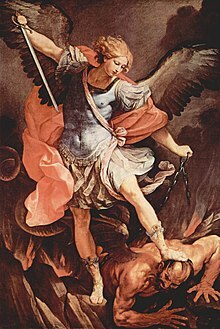 Seraphim: In John Milton's Paradise Lost Satan and the Archangels belong to this choir ("archangel" has here the meaning of "most powerful angel", not the members of the second lowest choir). Beelzebuth is also addressed as prince of the seraphim in witchcraft litanies. Cherubim: In Paradise Lost, Beelzebub and Azazel were cherubim before their fall. St. Thomas Aquinas in Summa Theologica states that Satan belongs to this choir, not to the seraphim. Thrones: Paradise Lost cites the demons Adramelec and Asmodai. Some sources mention Astaroth as well. Virtues: Witchcraft litanies mention Belial. 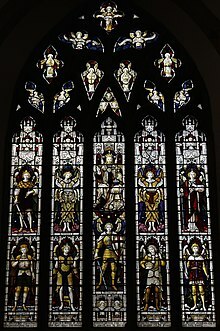 Archangels: The archangels Gabriel, Raphael and Michael, and supposedly the other archangels as well, are usually assigned to this choir, for example in the hierarchies of St. Gregory and St. Isidore of Seville. Beside these, extensive lists of angels and demons belonging to all the choirs can be found in The Lemegeton and The Sixth and Seventh Books of Moses. ^ Barker, Margaret (2004). An Extraordinary Gathering of Angels, M Q Publications. ^ Chase, Steven (2002). Angelic spirituality. p. 264. ISBN 978-0-8091-3948-4. ^ McInerny, Ralph M. (1998). Selected writings of Thomas Aquinas. p. 841. ISBN 978-0-14-043632-7. ^ "Strong's H8314 - Saraph". Blue Letter Bible. Retrieved 2015-04-01. ^ a b "Genesis 3 - NET Bible". Bible.org. Retrieved 2007-03-13. ^ a b "Ezekiel 10 - NET Bible". Bible.org. Retrieved 2008-11-10. ^ "Ezekiel 10 - NET Bible". Bible.org. Retrieved 2007-03-13. ^ "1 Kings 6 - NET Bible". Bible.org. Retrieved 2007-03-13. ^ "SUMMA THEOLOGICA: The malice of the angels with regard to sin (Prima Pars, Q. 63)". Newadvent.org. Retrieved 2011-12-05. ^ "Dionysius the Areopagite: Celestial Hierarchy". Esoteric.msu.edu. Retrieved 2011-12-05. ^ King James Bible "Authorized Version", (Cambridge ed.). Cambridge Edition. pp. Ephesian 6:10. ^ "NET BibleŽ - Ephesians 1". Bible.org. Retrieved 2011-12-05. ^ "NET BibleŽ - Ephesians 3". Bible.org. Retrieved 2011-12-05. ^ Strong, J, Strong's Exhaustive Concordance of the Bible, Riverside Books and Bible House, Iowa Falls (Iowa), ISBN 0-917006-01-1. ^ Vatican bans rogue angels. Telegraph.co.uk. Retrieved 2019-01-03. ^ Why the book of enoch is not included in the bible. Catholic.com. Retrieved 2019-01-03. ^ "CATHOLIC ENCYCLOPEDIA: Guardian Angels". www.newadvent.org. Retrieved 2016-03-05. ^ Online, Catholic. "Who are our Guardian Angels? - Angels - Saints & Angels - Catholic Online". www.catholic.org. Retrieved 2016-03-05. Barker, Margaret. An Extraordinary Gathering of Angels. M Q Publications, 2004. Copeland, Mark. Ministering Spirits: Angels In The Old Testament. Executable Outlines. 2004. Copeland, Mark. Terms And Descriptions Of Angels. Executable Outlines. 2004. Fares, Aymen. Angelics and the Angelic Realm. Spiritual.com.au Pty. Ltd. 2000. Tatum, Johnny. The Hierarchy of Angels: Hierarchical Chart of Angels. Worldnet Grace Ministries. Tatum, Johnny. The Hierarchy of Angels: Distinguishing the Higher Ranked. Worldnet Grace Ministries. Pseudo-Dionysus the Areopagite. The Celestial Hierarchy. C. A. Patrides. "On the orders of angels" (Chapter one). Premises and Motifs in Renaissance Thought and Literature (Princeton, 1982). ISBN 0-691-06505-5.